When you think about things that cause wrinkles, sagging, and age spots, you probably blame the sun. And you’d be right: Sun exposure is the number one culprit in aging skin – but there are so many other factors. Some we can control, and others, we can’t. It’s normal for the actual structure of your skin to change with age. Its outer layer thins and the number of pigment-containing cells decrease, resulting in skin that appears thinner, paler and more translucent. Remember the strong, firm skin you used to have? That strong and resilient framework and structure that supported your skin for so long is now getting tired; it’s weaker and less elastic, affecting the strength and elasticity of your skin. And you might bruise or bleed more easily: that’s because blood vessels become more fragile with age. There’s more. The forces of gravity, stress, obesity, your daily facial expressions and even the way you sleep all have a hand in the way your skin choses to age. Maybe you’ve been awarded with the lucky genetic card. You know the one I’m referring to: The card that gave you those coveted genes for smooth, pore-less, creamy and luminous skin, with little telltale signs of aging. Skin that looks gorgeous from the moment you lift your head off your silken pillow; skin that looks airbrushed (only it’s not). But most of us don’t fall into that category. When the cards were shuffled and dealt, we got the joker. 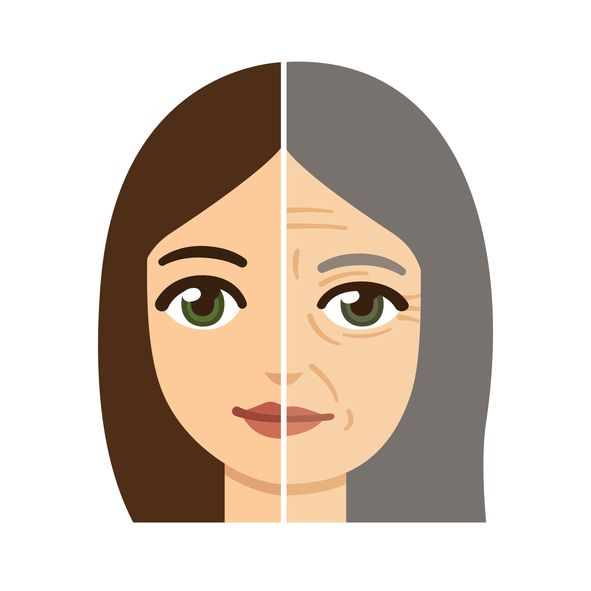 All jokes aside, though, there are ways you can deal with aging skin. Protect, protect, protect. Sunscreen is a must- even in the winter and on cloudy days. The sun’s UV rays are still capable of damaging your skin despite the cold, and the majority of these rays can also pass through clouds. Use an SPF of 30 or higher for best protection. This one is a primer and suncreen (SPF 50) all in one. Handle with care. Because your skin is more fragile, treat it that way. Avoid heavy scrubbing, which can irritate your skin. With gentle cleansing, you can still remove things like pollution, makeup and sweat, which, if left unchecked can further irritate skin. You should wash your face twice a day, advises the American Academy of Dermatology. Stay away from harsh skincare products. If they burn or sting, it means your skin is being irritated, which in turn can make it appear older. Keep in mind that some prescription anti-aging products may cause stinging or burning (check with your dermatologist to make sure that’s okay). Use a moisturizer. It helps by trapping water in the skin, which can make it appear plumper and more youthful. Don’t tan. If you’re after that bronzed look, the art of self-tanning has come a long way since the orange-y yesteryear glow; there are many options out there. I haven’t tried this one yet, but I know St. Tropez makes a great product. If you think it’s too late to do anything about your aging skin, it’s not. Protecting it from the sun may help it repair some of the damage. Good skincare products, a healthy diet, exercise and adequate sleep can help give you a dose of extra-glow, too. And for those who chose to go the professional route, there are loads of new treatments and less invasive procedures available from dermatologists that can help, too. You might also want to read what I wrote about dry skin and menopause. Thanks for the great tips! I’ll add one moisturizer tip to the list. Just read about the importance of applying moisturizer to the neck, too, when you’re of a certain age. Would you agree? Very empowering indeed. You are right, women deserve to be more glowing. Skincare is really important to us.Thanks for sharing your thoughts and tips!